but i think it makes more sense to use the gaurI. more on that below. this shloka is to be recited in the morning. when you get up, just sit in the bed, don't rush out to get ready. say this shloka with eyes still closed, and open them by the fourth part (ma~NgalaM karadarshanam) and see your hands and smile. after this still don't rush out, say another shloka (coming up in next post), and THEN get down from the bed. this exercise is so good, that it helps you stabilize your blood pressure. if after lying for 6-7 hours, you suddenly get up, there can be a pressure drop in the brain and this is known to be the most important factor in early morning strokes. both shlokas when said slowly will take about 1-2 minutes which is sufficient to get your brain used to new blood pressure. 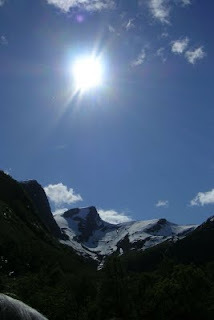 in hinduism a central idea is that the creator entered the creation, and enlivened it! that is why we say that there is the divine in all of us, all life forms, even inanimate things। that is why the supreme is also called 'antar-yAmI' (अन्तर्यामी) i.e. one who moves inside (us, living things). the shine of the diamond, the stickiness of the gecko feet, the long snapping tongue of a frog, the "7 tons a day feeding frenzy" of an orca whale are all the same divine shining! but what does it mean to say that the divine is in us? and what about the trinity of creator, sustainer and the transformer (also called the destroyer)? how do we interpret them in tangible ways, for those who are more into GYaan yoga (ज्ञान-योग) than bhakti yoga (भक्ति-योग) ? there are three phases of a thing - creation (coming into existence), sustenance and destruction (going out of existence). destruction is just a type of transformation. creation needs knowledge, hence the creator brahmA's (ब्रह्मा) consort is saraswatI (सरस्वती) - the divinity of knowledge. sustenance needs resources, hence the sustainer viShNu's (विष्णु) consort is lakShmI (लक्ष्मी) - the divinity of wealth, resource, prosperity. transformation needs energy, hence the transformer shiva's (शिव) consort is shakti (शक्ति) - the divinity of energy, also called as pArvatI (पार्वती) gaurI (गौरी) etc. lakShmI is in our fingers. why? because all we do to make resources, create or earn them, to type in a blog, to make a space shuttle or to plough the fields, we do it because of the opposable thumbs! because we can HOLD things in our hands and make tools etc. imagine if we didn't have the fingers and opposable thumbs! any progress ever? see the pigs and lions, still as they were! the palm like a book! the destiny on our palms! we make our own destiny with knowledge! or maybe they just didn't find a better place for saraswatI :) but there lies saraswatI. and the wrist, the power to use the hands is from the wrist, where lies the shakti, pArvatI. also, just like shiva is mahAdeva ('greatest god', explanation in later posts), pArvatI being shakti is the most important one! she powers the other two! imagine without energy to work or think would your body or brain be of any use? you first need energy, only then can you do anything. the divine manifestation is divided in three main categories - creation (kartA, कर्ता) , sustenance (bhartA, भर्ता), transformation (hartA, हर्ता) . and all these are powered by the three goddesses! and all these three powers are right there in your hand. so when you get up in the morning, don't whine, but rise and shine! the entire power of this universe - create, sustain and transform - is in your hands! be glad you have your hands, think for a moment if you didn't! it will be like you were without the divine force! while you have this faith in the divine, please do not let anyone take advantage of you because of your faith. that is not faith anymore, that is your foolishness and others' selfishness! beware of fake gurus, and fake godmen! the real ones don't ask for any favors, they don't try to save god or truth. we all HAVE to pay for our actions! so why is the version with "gaurI" better than that with "brahmA"? well, the other two are the goddesses, and wrist goes well with power, energy. 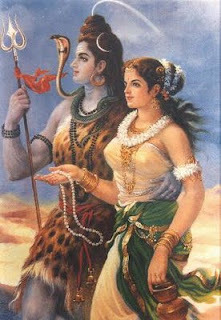 gaurI = pArvatI, shaktI, consort of shiva; fair colored; consort of shiva the transformer. Practical Sanskrit. All rights reserved. Visit us on Facebook. Gyaan Yog and Bhakti yog...what about Kriti Yog? It applies to them similarly too right? My grandmother taught me this shloka with a slight variation. Instead of "kara-moole sthitA gaurI, mangalaM kara-darshanaM", we say "kara-moole sthitA gaurI, prabhAte kara-darshanaM"
various combinations of the same basic elements. govinda, vedhase, brahmA, gaurI - are all one's favorites. i find that the one with gaurI fits best, makes most sense, hence i chose this version. similarly, lot of shlokas in hitopadesh have a word changed from the original, to indicate it is copied from the original source. prabhAte sounds appropriate, since it is a morning mantra. all of them are fine, and have the same import/meaning. i personally though favor the gaurI version for obvious reasons explained. @chrysalis - i didn't include vasudeva sutam - since it is not specifically a morning shloka, people may chose on their own preference. the samudravasane - is hinted in the post, and will be covered in subsequent posts. writing sanskrit in english is not very difficult. 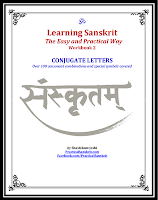 the transliteration scheme is posted http://practicalsanskrit.blogspot.com/2009/06/how-to-read-and-write-sanskrit.html please do read the chart, it is systematic. if you have any questions, please email me offline. I like the interpretation when you say "the force is in your hands". It's nice feeling to wake up and say "I can do it". Fred Kofman calls that "Player" attitude. 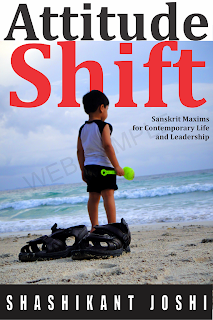 thanks shan, fred and many motivational, self help authors have taken a lot from indian philosophy and spirituality. it is a source of wisdom, just like we may borrow technology and use it! You said there would be another sloka coming up in next post which we should say before we get up from bed. Can you tell which is the sloka. I cant find it. Here is another version of the sloka but this time we have put Govinda in the center to balance both prosperity and knowledge otherwise our ego becomes too strong. yes, that variation is also covered above. brahmA, vedhase, govinda, gaurI etc - maybe according to iShTa deva one can pick. Nice Job Sir. Continue to enlighten. May you be Ever Blessed. Please post the full sloka in this blog. I was searching for this shloka to teach my son. Thanks for the explaination. Now he will not only know the shloka but also its meaning!!! I was searching for this shloka to teach my son. Thanks for the explaibation. He will not only know the shloka now but also its meaning!!! Yes. This is what I was about to say. We teach "prabhaate Kara darSanam" as this is the morning prayer! We also talk of ICCHAA SHAKTI, JNAANA SHAKTI and KRIYAA SHAKTI respectfully for goddesses Lakshmi, Saraswati and Parvati in that order. We teach Prabhaate Kara darSanam as this is a morning prayer. I would appreciate if you can share more information on these Shaktis for the benefit of growing children. Thank you for your great work. Love this blog. I too use this one.. I too use your version..
karmadhye tu govind SUprabhate kar darshanam. karmadhye sthito brmha prabhate kar darshanam! Why say- "It is auspicious to look at the hands" ? It always seemed to me that this was originally meant as a direction for what to do and not meant to be said as part of the prayer. Is it necessary to recite in correct pronunciation? I mean, It should be Laxmihi... and kar mule tu govindah. I am very confused about pronunciation. Will god allow me to recite in wrong pronunciation. Thank you for your comment. 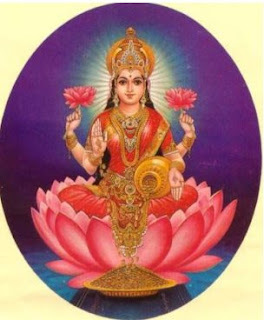 The correction on Lakshmi has been made. The other one on Govinda has been mentioned already in the first paragraph as a variation. very nice post! This sloka was taught by my grand mother, reading this post I remembered my old days, During the festival of navarathri I chant durga mantra with devotion, Thanks for providing it. please do ADD your NAME and PLACE, after the comment. (c) 2009-2017 Shashikant Joshi. Picture Window theme. Powered by Blogger.